Premature babies and young children were the big winners when Inteva added a charitable event to the General Motors Ride & Drive event hosted at Inteva Headquarters in Troy, Michigan. 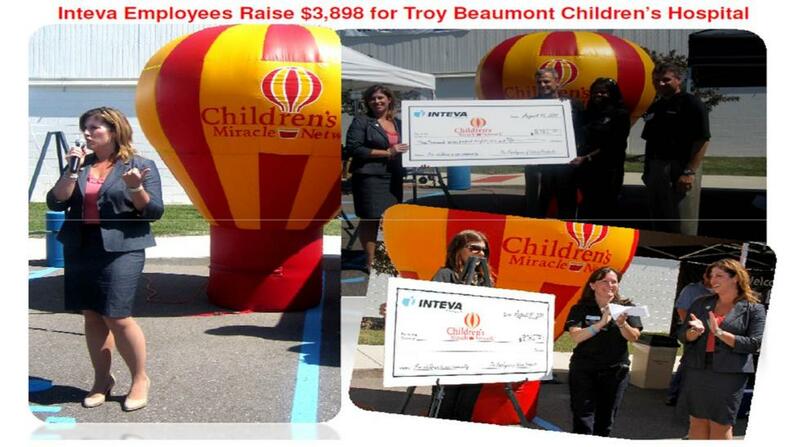 In conjunction with the day long Ride & Drive event, Inteva employees had the opportunity to financially support Troy Beaumont Children’s Hospital through one of three ways. Each way supported the Children’s Miracle Network, a foundation that helps as many children as possible by raising funds for children’s hospitals and helps to keep funds in the community in which they were raised to support the local children. All funds raised by Inteva employees went to Troy Beaumont Children’s Hospital to support their pediatric department and neonatal intensive care unit. The first way employees could support the local hospital was to purchase raffle tickets for one of 33 prizes that were donated by local businesses, General Motors and Inteva. “Involving neighboring businesses was a great way to expand the community support for our local children’s hospital,” said Kim Welch, Global Communications Director. In addition to these prizes, there was a grand prize drawing of an Apple iPad 2 and Inteva gift bags. The second way to support Troy Beaumont was through the purchase of an Inteva polo shirt. Employees could pay cash for a polo shirt or redeem “Inteva Bucks” for a shirt. “Inteva Bucks” were earned each time an employee test drove a GM vehicle. The third way funds were raised was through direct donation of cash or check. Some employees and local businesses provided direct donations. As the Ride & Drive event came to a close the funds were counted by the Finance Department and a giant check for $3,786 was presented to Laura Willis, Nurse Manager of Pediatrics and the Neonatal Intensive Care Unit at Troy Beaumont Children’s Hospital. She shared her thanks to Inteva Products and explained that the donation will go towards supplies and equipment for the Special Care Nursery for newborns. After the check was presented and all pictures were taken the donations continued to increase! At the very end of the day a final check was written to the Children’s Miracle Network for a total of $3,898. This gesture of giving during a company event was a great way for Inteva to express the importance of community commitment, a value throughout the company. “We are so grateful for your thoughtful contribution in support of the Children’s Miracle Network and Beaumont Children’s Hospital. Your donation is already at work, filing needs and providing better health care for the countless children who rely on the important programs and services provided by Beaumont Children’s Hospital,” said Tom McGannon, Associate Vice President, Development of the Beaumont Foundation.